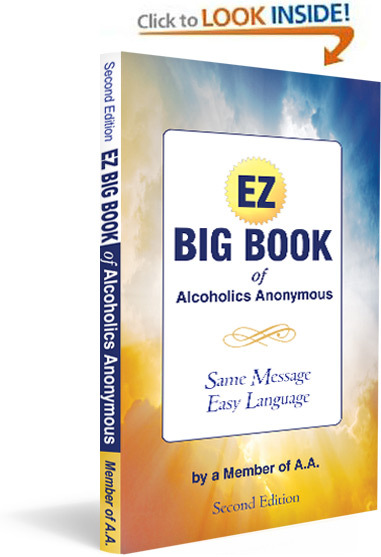 The EZ Big Book of Alcoholics Anonymous is a paragraph by paragraph “translation” of the original Alcoholics Anonymous (Big Book) published in the 1930s, updated for modern readers. The EZ Big Book brings the same powerful AA message to readers who find the original text hard to digest for any reason. The EZ Big Book is easy to understand for both native English speakers and for those who speak English as a second language. The EZ Big Book doesn’t include references to any specific religion. It’s friendly to all faiths and to those who are non-religious. The original Big Book was slanted toward men who had wives at home. The EZ Big Book makes no assumptions about gender. The EZ Big Book covers the same 12-step program as the original Big Book with no loss of meaning. It’s just more friendly to read. Follow us on Twitter or scroll down in the box to the right to read our latest tweets.